1800’s Antique Iron Military Quartermaster Beds, also known as “campaign beds “, opposed to many beliefs that these were just simple twin size iron beds, were used by military officers in the field. They were popular because of their ability to be disassembled and carted to a new location without much effort. Yet the enlisted “grunts”, as they were referred to slept in “bed rolls”, or what we now refer to as sleeping bags. They unfortunately were not sewn shut on two or three sides and they didn’t have zippers to help hold in the bodies heat. The simple beds that you see in this photo were used by the officers in the field, but not back at the barracks. Back at the barracks these similar metal beds were used by the enlisted “grunts”. But the officers had much more elaborate bed frames. Upon close inspection of these Quartermaster Beds, you can see on the center round casting has an American Eagle and a crossed “key and sword”. 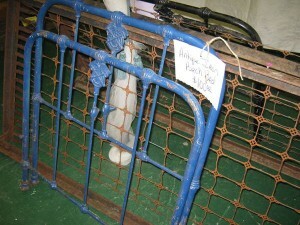 There are also small hoop castings that were meant to hold a modified canopy netting. I can only assume this was for summer time in regions that had mosquitoes or pesky bugs. These Quarter Master Beds were our version of the French Campaign beds that fold up into a nice tight unit. They had integrated hinges that worked beautifully and still do today when you can find one. They also were much more ornate and scrolled than the Austere style frames pictured here. They had a definite French Art Nouveau look to them and seemed almost out of place to be carried along on military campaigns and battles. We could have learned a lesson from the unique manner in which the French Campaign beds folded together. Our Quarter Master beds came apart easy enough. But then each individual part had to be carted and then put back together…..loose one piece and your out of luck. When it comes to collectibility, all antique iron beds have been elevated considerably in the past 10 years. But unique pieces like these Quarater Master Beds really have a historic background. to answer any and all questions you might have about antique iron beds. I also invite you to take a look at our company Face Book page for multiple photo albums on Custom Finishes, Canopy Conversions and a comprehensive “Before & After” King Conversions album.